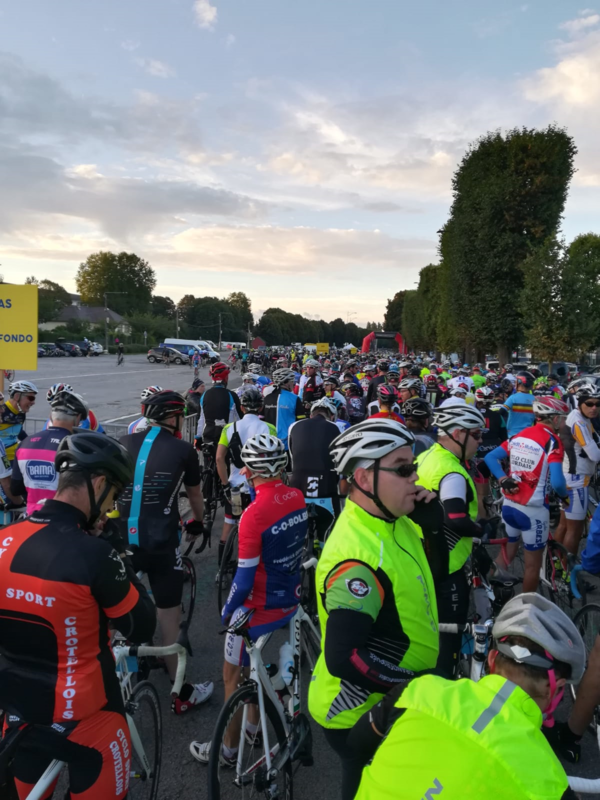 In what has become somewhat of an annual event for some members of our club, La Ronde Picarde, a sportive held every September in the picturesque countryside of Northern France, Phil Skelton was asked to write a blog of his experience’s of this years event. So, in the indomitable words of Phil, I will leave you to enjoy his ramble along La Ronde. Sportives are great fun. You get to meet people from all walks of life and from a variety of places. Put a timing chip on, add a cut off point for a gold medal and if you’ve a competitive streak, then all this changes. The change isn’t that of a race but it can inhabit a space of somewhere close by. This year was my fourth year in a row to be lucky enough to be on the Stephen Kelly organised Ronde trip. Each year it’s been different with different mixtures of people adding to the overall fun. This year, we had our biggest number with 19 people travelling and the craic was mighty as always. A great mixture of individuals, many who would have never met, without the common thread of the simple bicycle. As with many of these trips, there is no substitute for having your own bike and we are extremely lucky to have people such Stephen and Fran to drive to the destination with vehicles loaded with pre-packed bikes. As a bonus, Fran’s van could take our cycling gear so those who flew instead could avoid the hefty baggage fee. The destination for all is a campsite near a village called Mianny. The area is packed with WW1 history being near the Somme and a visit to the battlefields is a sobering experience. Similar tales were regaled from other bungalows and hydration in the form of Cote de Rhône with a mixture of Belgian and French beer was guaranteed. Good fun, but importantly, never ‘messy’. Nothing like a morning bike ride to curtail the outer reaches of booze intake. Last year, we had a wet week and a lot of flint gets washed out from the Picardie fields and we had punctures galore. This year we were gifted with sunshine and it made for a much more pleasant experience. Different routes were chosen on days leading up to the main event and the more experienced riders amongst us were keen to show others the first part of the route which can be a little tricky. Others did their own thing but such is the quality of the roads, you could be confident that whichever direction you took, smooth roads were guaranteed. The winds though are much different to home where our ditches protect you somewhat. In the wide open spaces of Picardie however, it’s a much different experience. Being able to ride in echelon format helps greatly. 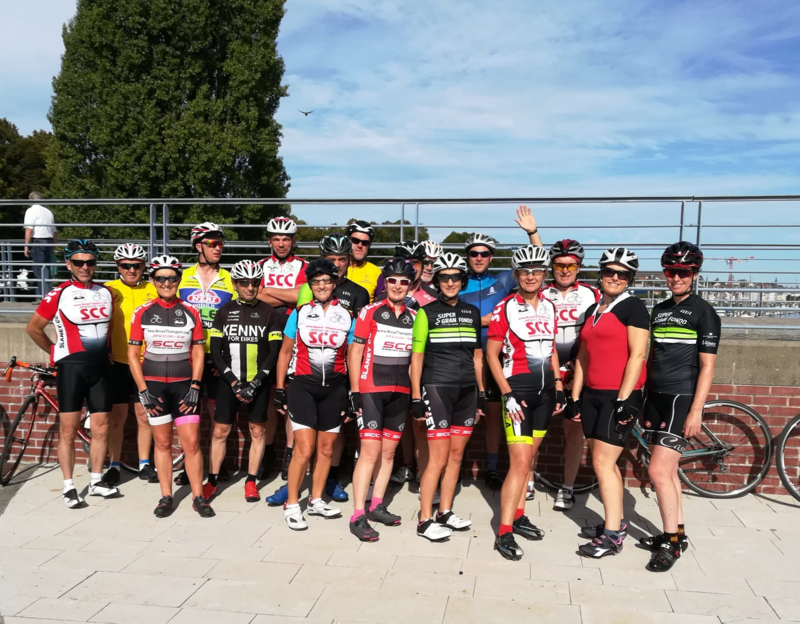 Event day came on Saturday in perfect weather and I took my place in the leading group along with cycling legend Bernard Hainault who was the event guest. Like all such events, I think just how privileged, I am to be able to do this and sapped up the atmosphere of 1,500 riders all rearing to go. I had prepared for this event in the couple of months leading up to it, doing high intensity 2/3 hundred metre drags in high intensity mainly on Forth Mtn but also the coast road attacking the drags. The previous years, I was being shelled out the back of these drags on the route and left in no man’s land. The rest of the training involved tempo spins keeping the legs honest. All ready for the off in Abbeville. Shortly after 8am, I rolled over the starting timer and it was hell for leather for the first 40kms of this 191km Ride. This part of the event is like being in a race as riders jockey for position. Around 1,500 metres of climbing lay ahead and make this spin very much like the coast road from Curracloe to Courtown but exposes you to much greater winds. The group that I found myself in were much better than I was but I managed to keep up with them until the first drag but I had burned a lot of matches doing so. At around km 40, I could feel my old adversary, cramp, welling up in my thighs and had to ease back and spin it out. This got me to the first food stop with an average speed of 35.4kms per hour. This is at the 91km mark. We are spoilt for food stops on Irish sportives. This is nothing like the Mt. Leinster Challenge which is a veritable smorgasbord. The Ronde has a few croissants, some fruit, energy drink and water and that’s it! The timer doesn’t wait so the longer you dwell, the more time you lose. I had brought enough food in the form of bananas, energy bars and gels. A couple of High 5 sachets and zero tabs dissolved into freshly filled bottles and it’s away again with the average speed having dropped to 34.5km/hr seems somewhat unfair, but that’s the joy of a timer. 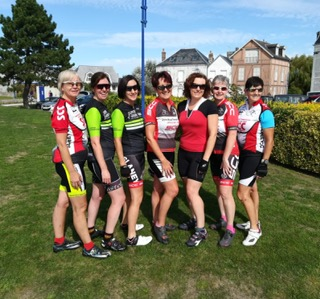 The group that I had arrived with were mostly doing the shorter spin of 130 kms, so I had the next 10kms on the road on my own with strong side winds burning more matches, kicking off more cramps. I eventually caught up with a group of 10 Belgian riders and the presence of others to share the load, eased the pain. These guys were used to riding in echelon into crosswinds and it was great to be part of it and picking the draft sweet spot. The kms rolled by at a good pace that suited me but the surge of pace away from junctions was taking its toll. Other years, I had raced a little and the legs could handle this more easily but I had to dig deep this year. I had it in my mind that the distance was 184kms as it was in previous years, but this year the organisers had added in some extra kms to bring the total to 191kms. I knew that I was on gold medal time but I wanted to do a PB. The last 10kms ramp up and down some steep sections and forces you into deep pain territory. With 5 kms to go, you sometimes get a lift and for the first time the dull cramp pain disappeared. I time trialled to the finish and crossed the line with 34km/hr on the clock. This beat my previous times by a few minutes even with the extra 7 kms thrown in. Like all such timed events, you do this for yourself, not to impress others. When I started cycling first around 7 years ago now, the words of Bill Jordan still ring in my ears “none of us are any good really in the broader sense. Whatever you get out of cycling, let it be for yourself and make sure you enjoy it!” That I did, in that pleasure/pain way that cyclists understand. The night after the event of course, we all turn into fishermen and tales of ‘the one that got away’ in the cycling sense abound. Great achievements by all especially those who had never done anything like this before. Some getting up high in their category. The ladies especially did us proud. Alan took a wrong turn and ended up doing the long spin on what was a veritable gate with a pair of wheels; there’ll be no stopping him with a new steed! For this night we traditionally head to a local Abbeville, craft beer restaurant and the banter is always top class. Drink and merriment with people with similar interests regaling tales from their own walk of life are special treasured moments. The last night, as per tradition, we head to a local bar run by Jean-Paul and his wife Marie (I think). This is what we call the Allo! Allo! Bar. This bar sponsors a local soccer team and one by one the players come in and shake your hand and introduce themselves and invite you to the lounge for baguettes, cheese pate etc that the pub puts on for them. Four years ago myself and Race around Ireland legend Mick Foley spend nearly 12 hours on the drink there to the astonishment of the locals. We have been welcomed with open arms since then and a warm embrace always awaits where my pidgin French seems to improve with every drink. The French lads join in in our sing-songs, we sing La Marseillaise with them and the banter is top class. Jean-Paul orders in pizza for us all on the house and we drink a little more. Everyone has a party piece and some gems are thrown out there. Johnny Brennan with a bicycle song that’s absolutely brilliant. Stephen & myself normally help each other through ‘The band played waltzing Matilda’, Mylie for a blast of the Green fields of France which after a week of great cycling ends on a poignant respectful note. Till next year, au revoir Picardie!